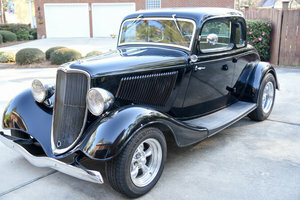 A 1934 Ford 3-Window Coupe is a true icon. So when this slick purple hot rod also has a performance V8 and a custom A/C interior, you know you\'re looking at a terrific street machine for a terrific price. This is true vintage style merged with a ton of the best updates. The fiberglass body fits together with precision, and it has a great durability factor. And that modern purple paint instantly commands attention with its shine. This one has an extra sleek style that doesn\'t have door handles or bumpers. So there\'s even more focus on those iconic Ford curves that are now even more radiant thanks to the clearcoat shine. You\'ll love the modern touches like the LED taillights and power rear license plate frame. They go nicely with the true classic hot rod features like the silver and white custom pinstriping, waterfall grille, suicide doors, and 15-inch polished alloys with staggered tires for an aggressive stance. See what we mean about the expert merging of vintage and new? Pop the remote door openers to reveal a full custom interior. Plush leather bucket seats coordinate with custom door panels to show you this has comfort and style. The exterior purple and the pinstriping return on the dash as a reminder of what a thoughtful build this is inside and out. There are even great features like power windows, an AM/FM/CD stereo, and cold R134a air conditioning. But one look at the competition-style tach mounted below the dash and the B&M Pro Stick ratchet shifter, and you know this is more than just a coddler. They invested in plenty of polished flair in the engine bay since this one is on display for the world to see. Even the block is painted to match the car\'s purple. But beyond the style is some serious substance. This 350 cubic-inch V8 inhales deeply with a Demon four-barrel carburetor. It exhales with authority as long tube headers adds even more power while contributing to the rumble of the dual exhaust. This is a muscular package, and so it has the right components to get the power to the ground. This includes a strong TH400 three-speed automatic transmission, four-link rear (with stabilizer bar and adjustable coilovers,) and extra wide Mickey Thompson rubber in the rear. More than just knowing how to deliver the power, it also has great driving features like four-wheel disc brakes and an aluminum radiator w/electric fans. 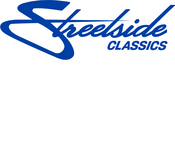 Complete with maintenance records, if you like your classics complete, powerful, and premium, then don\'t miss this deal. Call today!! !